The Rules of Golf: Do water hazards have to contain water? This is the new name for a water hazard and the committee can now mark something as a penalty area even though it does not contain water. If possible, you can play from a penalty area and, in doing so, can now move loose impediments, touch the ground when taking a practice swing and ground your club in the penalty area. To take relief from a penalty area you need to know or be virtually certain that your ball is in the penalty area. This means you need to be at least 95 per cent certain. When taking relief from a yellow penalty area, you have two options for one penalty stroke. Take stroke-and-distance relief or take back-on-the-line relief using the hole and estimated point where the ball last crossed the edge of the penalty area to give you the reference line. You should mark your chosen reference point on the reference line and drop within one club-length of this point not nearer the hole. If your ball is in a red penalty area, you have a third option of taking lateral relief for one penalty stroke. This allows you to drop within two club-lengths of the estimated point where the ball last crossed the edge of the penalty area. You can take unplayable ball relief anywhere on the course except a penalty area. Generally, you have three options, each for one penalty stroke. You can take stroke-and-distance relief or back-on-the-line relief using the hole and the spot where the ball lies to give you the reference line so that you can mark a chosen point on that line and drop within one club-length no nearer the hole. Lastly, you can take lateral relief, which allows you to drop within two club-lengths of where the ball lies, no nearer the hole (Rule 19). If your ball is unplayable in a bunker, you now have four options for relief. 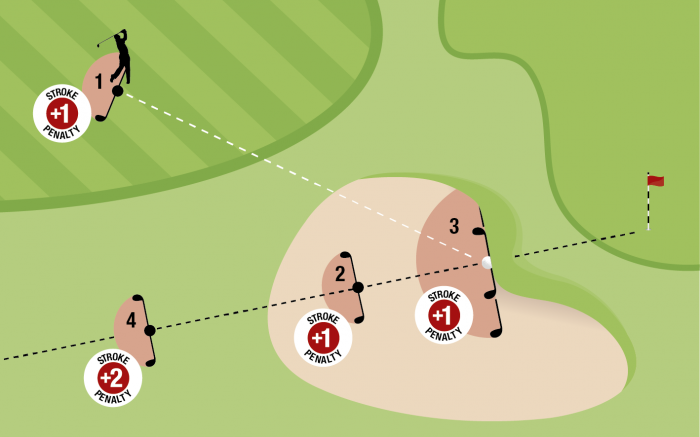 For one penalty stroke you can take stroke-and-distance relief or take back-on-the-line relief using the hole and the spot where the ball lies to give you the reference line, but you must drop in the bunker, or take lateral relief, which allows you to drop within two club-lengths of where the ball lies, not nearer the hole, but you must drop in the bunker. Finally, you now have the new option, for a penalty of two strokes, you can drop back-on-the-line outside the bunker (Rule 19). This is the test that is used in the Rules to decide whether your ball is in a penalty area or whether your ball at rest has moved or to determine what caused your ball to move. To meet this test, there needs to be 95 per cent certainty that the event in question happened. 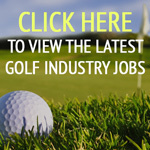 For example, if you cannot find your ball and you are not 95 per cent certain that it is in a penalty area, your ball is lost, and you must take stroke-and-distance relief. The ‘Rules essentials’ are available on The R&A’s website. There is also the Rules of Golf app for easy reference. Visit Randa.org for more information. Seems confusing to me to still use the terminology of yellow and red water hazards. Surely simpler just to deem all former yellow or red water hazards as penalty areas and then proceed as described?